This is an amazing opportunity to join with others, up to a maximum of 12, for mothers to have an alpaca treat. Limited numbers so everyone gets the best experience we can give them – complete with tea/coffee and homemade cakes. A special treat for your alpaca-mad loved one. You can even buy a voucher so you can plan ahead and let them know what is coming – not everyone loves a mystery tour! Ideal for birthdays or anniversaries too. A two-hour visit including refreshments for you and the alpacas. 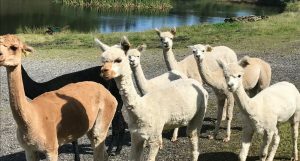 You get to have a farm walk among the herd of alpacas, learning about them in a relaxed style with lots of stories about the many characters here at Welsh Valley Alpacas. A hot or cold drink with homemade cake. You get to feed the alpacas which means you can get up close and spend some time around these unique animals. Why not buy your alpaca-mad loved one a Welsh Valley Alpacas gift voucher? The time for shearing approaches and the alpacas find ever ingenious ways to stay cool. Went to feed them and found them all ‘chilling out’ in the internal shade of the stable. I had to step round some because they were so comfortable thank you very much. Breakfast eventually won out but it was touch and go. The young ones, with the finest fleece, are also debris magnets. Any loose bits of bramble or gorse, or hay, or small twigs from tree brushing, all stick to the surface and are reluctant to fall off of their own accord. 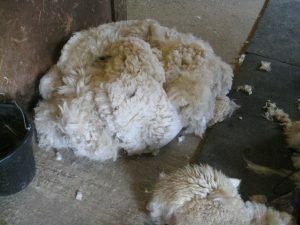 Quick de-debris before shearing helps. 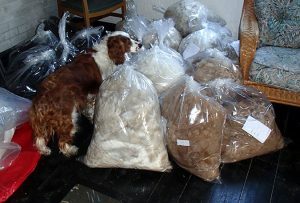 Preparation of the fleece from start to finish of the shearng process makes for better alpaca fibre to work with afterwards. Sorting as we go fleece gets bagged as first, seconds and thirds – and reluctantly – rubbish (too dirty, too much vegetation, too short). Hard work but makes such a difference to the animals in terms of well being and is the harvest of the prime product from these amazing animals. Olaf & Jac looking like fluffy teddy bears. 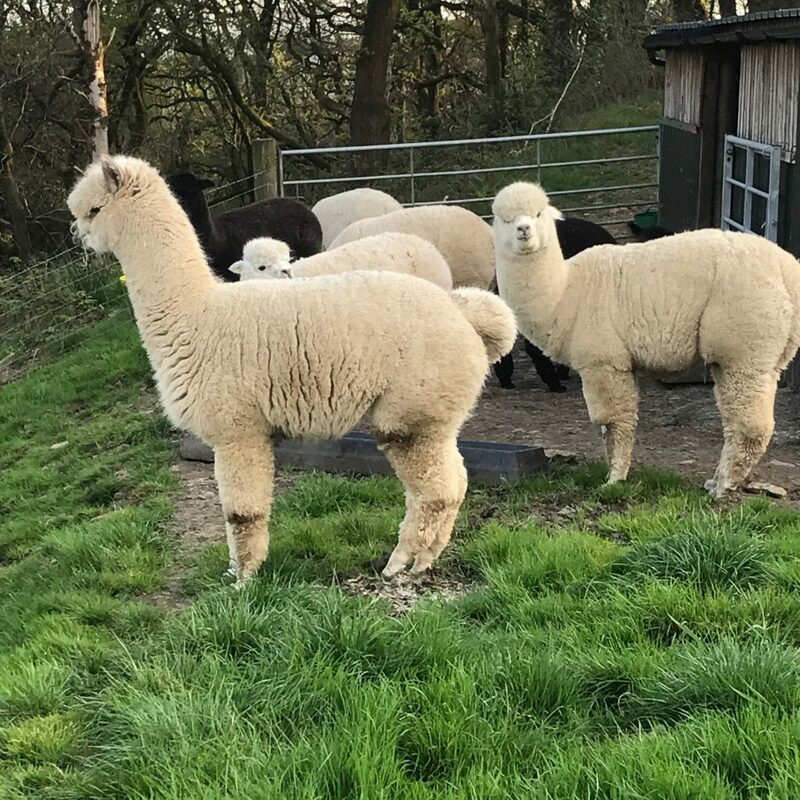 Early spring was pretty wet but now we have had a dry spell the alpacas have fluffed up and gone back to their correct colour (instead of shades of mud) So when they get hot on a summer afternoon they start to roll – raising a cloud. My heart always sinks slightly at this, as I think of the dust and grit singing in the shears in a few weeks time. 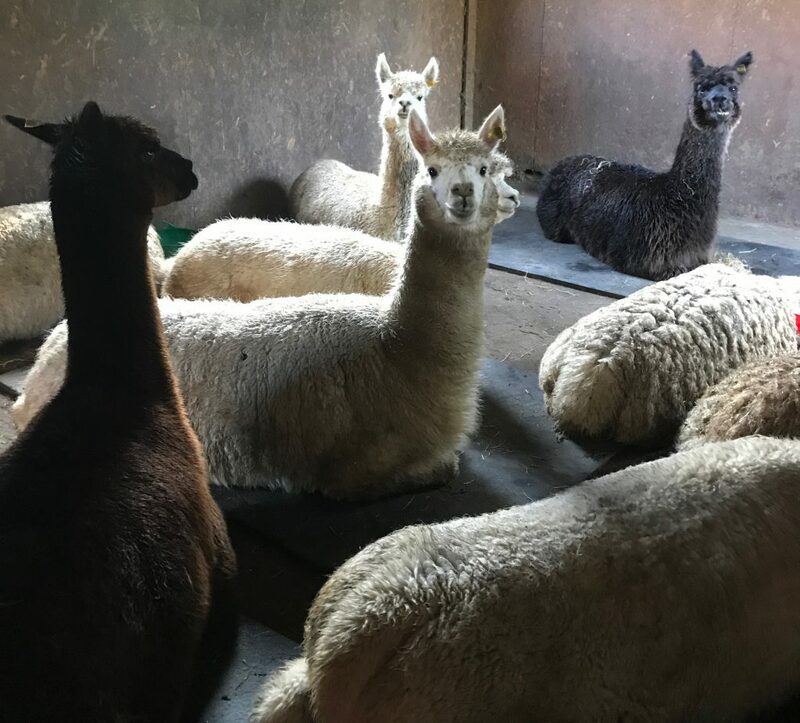 Timing for shearing can be tricky because you see the alpacas looking uncomfortable and rolling and think we must be close to shearing but then if you look at the night time temperatures you realise they could do with hanging onto their fleece a little longer. As it gets closer you also need to be watching for dry weather – at least the day before shearing so the fllece is dry and the day of shearing. 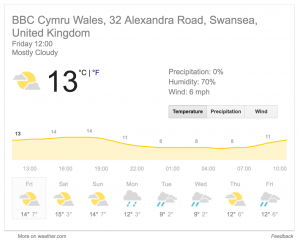 That’s finding two dry days in a row in South Wales – it does happen, honest! Meanwhile, I can take advantage of a few weeks still to go and make sure all of the equipment is sharp clean and maintained. Makes life easier. Also check supplies of bags, shearing oil and blue paper roll – for all kinds of things. Print out labels for the bags and plan any husbandry to be done at the same time – e.g. worming or vaccinations. About to get pretty busy!